Definitive Technology makes simple, great-sounding whole-home wireless audio systems for smartphones and tablets, including the iPhone, iPad, and the iPod Touch. Using DTS's breakthrough Play-Fi(TM) technology, you can stream your favorite tunes over Wi-Fi right from the app to the Definitive Technology Wireless Collection Speaker(s) connected to your existing stereo system. It's a huge step up from Bluetooth - the audio quality and reliability are outstanding, and you can enjoy music from your phone in one room, or all your rooms. The "Hi-Fi over Wi-Fi" listening experience is just a touch away, thanks to this handy app. Choose a speaker, choose a song, and your favorite tunes are streaming all through the house. 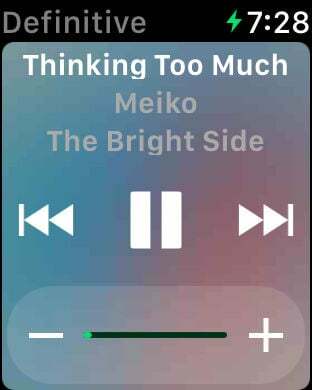 The app offers built-in streaming options: use Pandora, Songza, Deezer, AM/FM and Internet radio, DLNA servers, or play anything from your iTunes music library, including your playlists. The app automatically organizes and indexes the music for you. The app also handles set-up for your speakers, and gives you full control of volume and speaker selection. Choose one, or stream to all of them at once. Please note that the Definitive app is companion software to the Definitive Technology Wireless Collection, and other products enabled with Play-Fi technology. It is not intended as a stand-alone audio player.